This young Swainson's Hawk shows long and relatively narrow wings. Photo by Shravan Sundaram via Birdshare. Perhaps it’s their large size and penetrating predator eyes. May­be it’s the way they soar high in the sky, seemingly without a care in the world. Whenever we encounter rap­tors, these mesmerizing birds compel us to take a good long look. And the longer we look, the more we’re inclined to wonder: what bird am I looking at? Incredibly, experts can key in on what appears to be the tiniest speck in the sky and call out “Red-shouldered Hawk” or “Golden Eagle,” while oth­ers might struggle just to lay eyes on the speck in question. It takes years to get to that level, but there is no sorcery involved—just a lot of practice. These raptor masters are focusing on a few key features that separate one species from another. 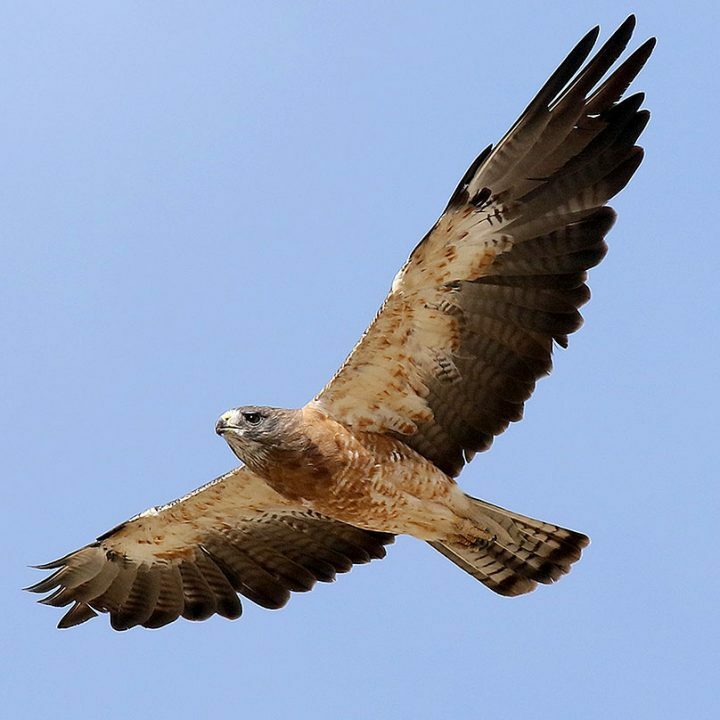 At a basic level, buteo hawks have round­ed wings and short tails while accipi­ter hawks have rounded wings and long tails, and falcons have pointed wings. But once you estab­lish that you’re looking at a buteo, what clues set a Red-shouldered Hawk apart from a Broad-winged Hawk? Or a Swainson’s from a Red-tail? You can learn a lot by looking at subtler aspects of shape and flight behavior, says Sullivan. Broad-winged Hawks have moderately pointed wings. Photo by Brian Sullivan. 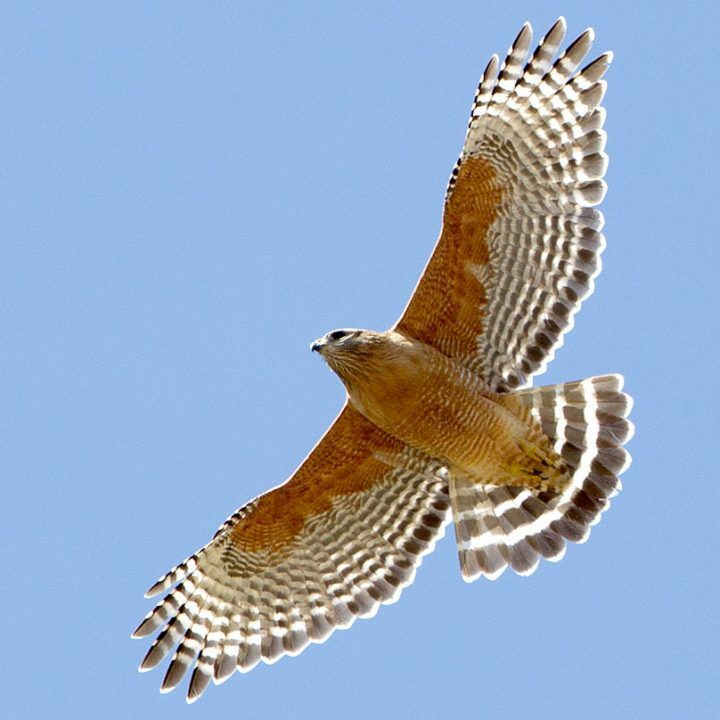 Red-shouldered Hawks have forward-arching, squared-off wings. Photo by Brian Sullivan. Red-tailed Hawks have long and broad wings. Photo by Brian Sullivan. Swainson’s Hawks have narrower, more pointed wings. Photo by Steve Bennett/Macaulay Library. Fall is perhaps the best time of year to observe a large variety of hawks, especially at one of the hundreds of daily hawk watches that occur during fall migration at locations around North America. Thousands of hawks funnel through these geographic hotspots, and a hawk watch site will always have at least one, and likely several, experts on hand. Many are happy to explain how they make those impossibly distant IDs. Spend some time at your favorite vantage point, and those specks in the sky will seem closer each day.